At the beginning of this week the Archives Reading Room re-opened after our two week annual closure. Sadly, we don’t disappear off for a fortnight in the sun while we’re closed, we’re hard at work undertaking some of the tasks that we’re unable to do while we have a Reading Room full of researchers! We thought it might be nice to do a few posts looking behind the scenes at some of the things we’ve been up to. Today, we’re entering the exciting world of…. 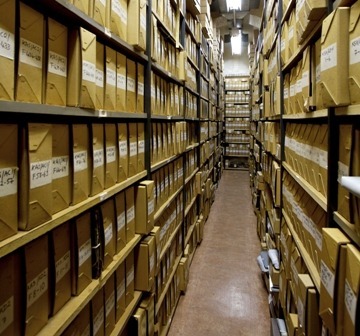 In an average year, we produce between 6000-7000 archive items for our researchers to consult in the Reading Room. The Archives team will also produce another thousand or so for use in research enquiries, teaching sessions and visits, exhibitions and digitisation. Every single one of those items has a place in one of our stores, and one of the most important yet challenging things we have to is to make sure that every last one of those items makes it back to its rightful place. Those of you who have visited us (or any other archive) will be aware of the document request slips with the pink carbon parts that must be filled in for each item requested. That is our first line of checking – when we take something off a shelf the pink part is left in its place, and when we return it we take back the pink part, match it back with the white slip and voila! We know that the archives are safely in their home. But sometimes those pesky slips go astray – they fall behind our mobile shelving as we move them, or blow off trolleys as we make our way down corridors, or researchers take them home with them – and we’re unable to play our usual game of ‘Archive slip snap’. So the first thing we need to do in our closure is to go through all of our records of the previous year, and for any item that we haven’t been able to check using the slip method, we have to check by going through the boxes. Occasionally something isn’t there, in which case we can use our records to check when they were out, and what else was out at the time, in order to work out which other boxes we should look in. This normally solves the mystery – it’s remarkably easy to pick up two files at once thinking you’ve only got one, and accidentally put things back in the wrong box. Sounds dull, doesn’t it? That’s because it is. But it’s also vital to us being able to provide access to all of these records, and in making sure that when you visit us wanting to see something, we can actually find it! Imagine trying to find one missing thing amongst all this. That would be hard enough but we have 10 times as many boxes as this!